As the igniters lined out at the top of the ridge, I could see a mix of apprehension and excitement in their eyes. Forest Stewards Youth Corps (FSYC) Fire and Fuels crew members spent the last five weeks training for this moment. They had cleared fence line and prepped burn units, but it wasn’t until they had drip torches in their hands and a hotshot barking orders at them that they realized … this was for real. That the “10s” and “18s” actually meant something, and that yes, you really have to carry that much water. Their training was more than “a training” now; it was their foundation for actually accomplishing implementing forest restoration, and doing so safely. At the beginning of the season, we asked our 16 crew members why they wanted to be on the FYSC Fire and Fuels crew. The overwhelming response: they wanted to be hotshots. To help them attain that goal, the Forest Stewards Guild (Guild) staff designed a holistic program that incorporated more than just hard firefighting skills. This was an ambitious goal, especially because we’d also promised that the crew would be working as a fully-qualified hand crew for two ranger districts on actual implementation. We wanted crew members to see that being a hotshot was about more than just being physically strong. It means knowing how to work as a team. Keeping track of your gear and being responsible for yourself and accountable to your crew. Running out of water or forgetting to pack a lunch isn’t just your problem, your preparedness affects your crew’s ability to work. Being a hotshot also means that you know how to make a profile on USAJobs and account for your skills and experience well enough to be considered for the position. No amount of instruction or lecturing could match hearing that from the lips of real-live firefighters (who we brought in as speakers). Patience. And options: Youth need options. The requirements to work on a fireline are straightforward and non-negotiable. Without the National Wildfire Coordinating Group (NWCG) coursework certifcations and a passing time on an arduous pack-test, you cannot be a wildland firefighter, let alone a hotshot. To try and ensure all crew members were set up for success, we “required” (keep reading to understand why that’s in quotes) all crew members to complete the NWCG basic firefighter online coursework prior to their start date. While a few crew members were able to navigate the online system and complete their coursework before arriving, the majority did not. Consequently, Guild staff poked, prodded and pleaded with crew members to finish the course work as quickly as possible. Myself, and many members of the crew, are now on a first-name basis with the poor soul responsible for fielding questions about the NWCG online training. At one point, I even updated the computers at the Mountainair Public Library in efforts to make the NWCG program work on the computers there (it still didn’t). So, then, I hand delivered Guild-issued a laptop to one of the last crew members needing to complete the training. Needless to say, moving forward, the Guild will directly facilitate the NWCG portion of the basic firefighting training as part of the program curriculum, and in-person. Once everyone had the coursework completed, there was still one problem: Two crew members hadn’t passed the arduous pack test we held during week one. 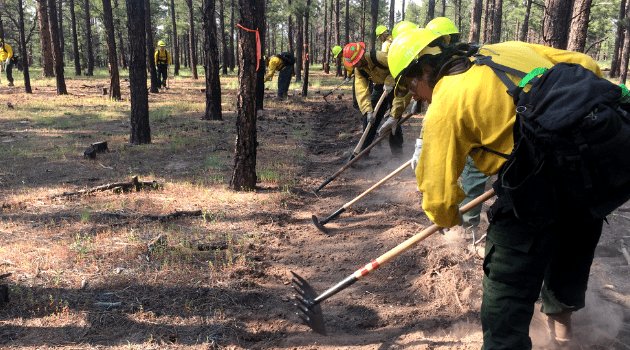 We promised the Espanola and Mountainair Ranger Districts (on the Santa Fe National Forest) qualified hand crews. Having a handful of crew members on the sidelines during a prescribed burn would have created an entire new set of logistical challenges, and it was of obvious benefit to those crew members to explore additional options. Fortunately, it turns out that the Forest Service accepts moderate pack tests for individuals working on a prescribed fire, so we set a date for both of them to retake the test with less weight. With their entire crew flanking them in support (even though they didn’t need to), both crew members passed. One crew member called her dad (a wildland firefighter) as she was crossing the finish line to give him the news. That scene affirmed the importance of having patience and persistence with youth. If they are willing to put in the work, sometimes they just need more time or a modification. Find success in the short and long term. As a youth development program, we learned to accept that “Success” is really a series of incremental successes , and it may not be fully realized in a 12-week program. Skills gained during the program can still contribute to members’ professional development even if they don’t start a career in fire immediately following the program. My season with the Forest Stewards Youth Corps has prepared me with the skills and knowledge necessary for a career in wildland fire. Through training and work, I was challenged and enabled to develop personally and professionally. This experience will forever prove to be an invaluable opportunity that I am thankful for. 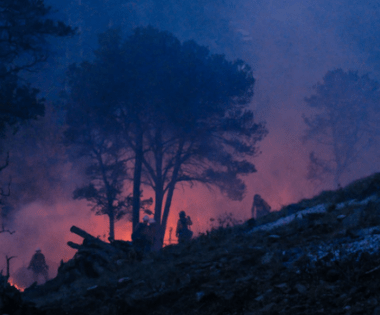 In total, the Espanola crew burned 500 acres in the Santa Fe watershed, effectively reducing fuel loading and reducing the risk of catastrophic fire in forests protecting Santa Fe’s best source of drinking water. 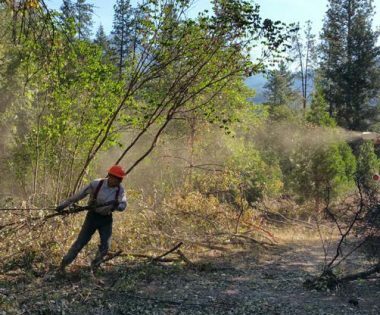 The Mountainair crew burned 157 acres of ponderosa pine forest adjacent to a community. The success of those burns is measured in more than acres, though. The burns made all of the training and instruction move from theoretical to literal. 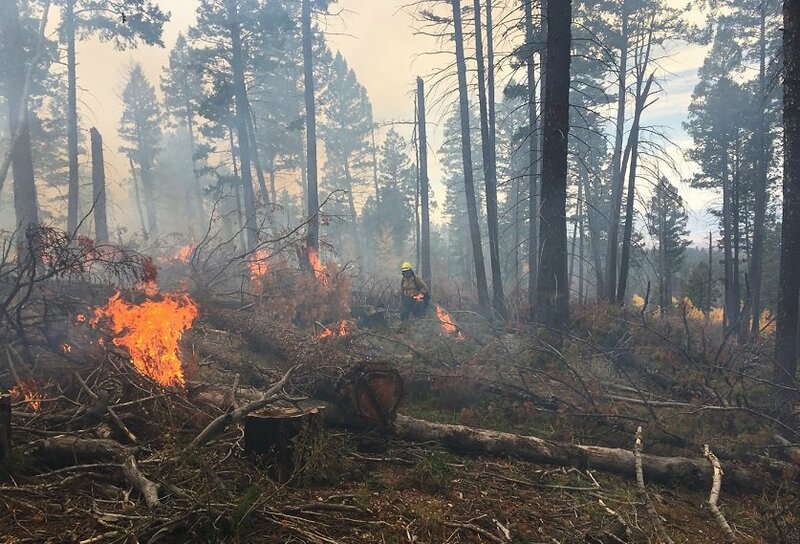 When we talked with the crews about what it means for a community to work toward fire adaptation, their experiences allowed them to reflect on the importance of multiple partners using fire as a restoration and risk-reduction tool. The sun hadn’t even set on the last day of the 2018 program, before we were planning how to improve for the next season. The challenges we faced were instructive not only in terms for teaching us what not to do in 2019, but they also helped reaffirm the foundational principle of the FSYC program: training, experience and mentorship are each essential components to the bridge that youth travel to reach their career aspirations . The FSYC Fall Fire and Fuels program will be back later this year, on both the Espanola and Mountainair Ranger Districts, so stay tuned for what we learn and achieve next!